The New Yorker Hotel is one of the most famous hotels in New York City. It is located in Midtown, West New York, close to Penn Station and Madison Square Garden and within walking distance from Times Square. 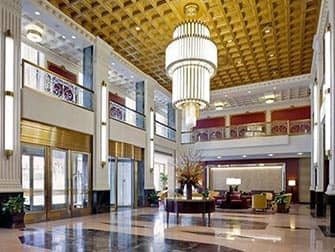 The New Yorker Hotel was built in Art Deco style and has a rich history. The building dates from 1930 and was once the tallest building in New York. 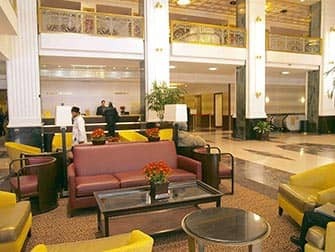 Many celebrities such as boxer Muhammad Ali and President John F. Kennedy, have spent the night here. 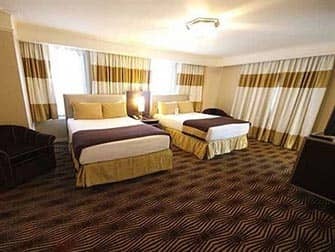 The 912 rooms at the Hotel New Yorker are non-smoking and each is complete with air conditioning, flat screen TV, fast Internet access, irons / ironing boards, bathroom with shower and toilet. In addition, a hair dryer can be provided upon request. The New Yorker is located in the middle of Manhattan and is easily accessible by public transportation. If you are lucky, you will get a room with a beautiful view of the Empire State Building. Furthermore, across the street from the hotel is Madison Square Garden where the New York Knicks games are played as well as many concerts. Eric’s Tip: What can I say? This is mostly my favourite. 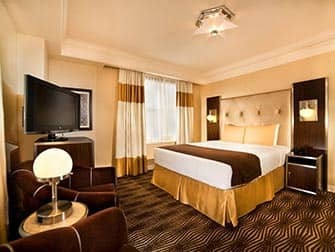 It is not the most beautiful or most luxurious hotel but the price / quality ratio is very good. The location is even better, if you are looking for a cheap hotel then this is probably for you. However, I am not a fan of the restaurant downstairs (Tik Tok), it’s expensive compared with other places where you can have breakfast.